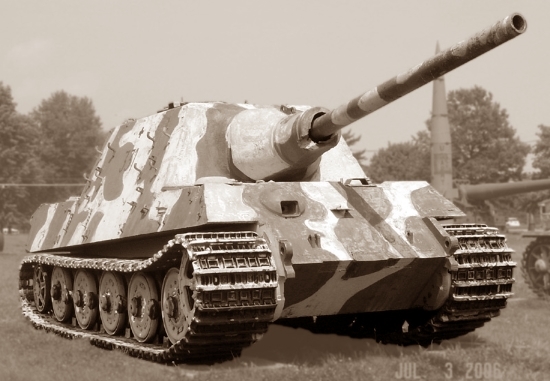 Though technically not a tank as it lacked a rotating turret to carry its main armament, the weapon generally known as the Jagdtiger (hunting tiger) was a super-heavy tank destroyer operated in small numbers by the Germans in World War II. The vehicle was more formally known as the Panzerjäger Tiger Ausführung B as it was based on a lengthened version of the chassis of the Tiger II heavy tank, and also possessed the ordnance inventory designation SdKfz 186. The Jagdtiger was the heaviest armoured fighting vehicle to see operational service in World War II, and remains the heaviest AFV to have achieved series production. The heart of this formidable weapon was its 128-mm (5.04-in) PaK 80 L/55 main gun, which outranged the gun of any tank fielded by the Allies and was capable of defeating the armour of any Allied tank. The Jagdtiger entered service late in 1944, and was operated on both the Eastern and Western Fronts. Its greatest exponent was Oberleutnant Otto Carius, who destroyed more than 150 Allied tanks and from a time early in 1945 led a Jagdtiger company of the 512th schwere Panzerjägerabteilung in the last weeks of the war on the Western Front. 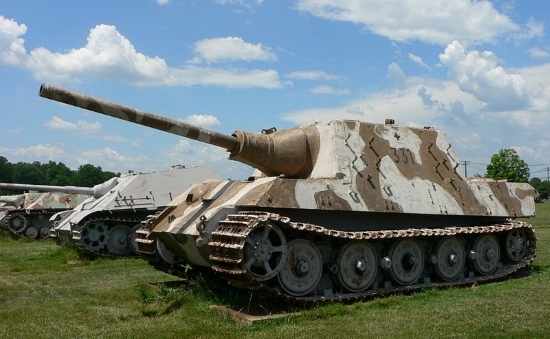 Some 150 examples of the Jagdtiger were ordered, but a maximum of only 88 was completed. Though formidable in terms of its firepower and protection, the Jagdtiger had a poor power/weight ratio, which limited its agility and cross-country capability, and plagued the type with mechanical problems. The success of the extemporised StuG III, Marder I, Marder II and Marder III vehicles in the tank destroyer role persuaded the Germans that still greater capability could be derived from the use of more advanced tanks to create a family of versatile and hard-hitting self-propelled guns. While the core of the concept was the reuse of existing hull and automotive (powerplant, transmission, suspension and track) designs, design time and manufacturing cost were both reduced by the replacement of the tank turret with a fixed casemate carrying a larger-calibre gun in a limited-traverse mounting. Early in 1942, as the severe shock of encountering the superb T-34 medium tank on the Eastern Front was still fresh in its mind, the German army’s general staff issued a requirement for a heavily protected vehicle carrying a 128-mm (5.04-in) gun, and on 18 May of the same year Adolf Hitler demanded that this gun be optimised for the tank destroyer rather than infantry support role. The weapon selected was a variant of the PaK 44 towed heavy anti-tank gun, whose 128-mm (5.04-in) calibre derived from the fact that all the equipment needed for the manufacture of guns in this calibre already existed for the production of naval guns. Design contracts for the towed gun were awarded to Rheinmetall Borsig and Krupp, and the prototype guns were delivered for testing late in 1944. Rheinmetall’s weapon was based on the FlaK 40 anti-aircraft gun, while Krupp created a completely new design. After initial trials, the Rheinmetall design was dropped and development was then centred on the Krupp design. Service trials quickly revealed, however, that a towed anti-tank gun weighing only slightly less than 24,250 lb (11000 kg) was impractical, so the towed design was terminated. In 1943 design work on a gun for the Jagdtiger tank destroyer and Maus super-heavy tank began on the basis of the Pak 44. This weapon, of which about 10 examples were completed, was known as both the PaK 44 and the PaK 80 (Panzerjägerkanone 80). The gun used ammunition of the separate-loading rather than unitary type. As a result of this, the gun could fire three differently sized propellant charges (light, medium and heavy charge). The light and medium charges were normally used when the gun was fulfilling the role of an artillery piece, a shell weighing about 61.73 lb (28 kg) being fired at a muzzle velocity of 2,772 and 2,887 ft (845 and 880 m) per second respectively to a maximum range of 26,685 yards (24400 m). The heavy charge was used in the anti-tank role, in which the 62.39-lb (28.3-kg) PzGr 43 APCPC-HE (Armour-Piercing Capped Ballistic Cap-HE) projectile was fired at a muzzle velocity of 950 m (3,117ft ) per second to penetrate slightly more than 7.87 in (200 mm) of armour sloped at 30° at a range of 1,095 yards (1000 m), and 5.83 in (148 mm) of the same armour at 2,185 yards (2000 m). The gun had a semi-automatic horizontal sliding-block breech arrangement and a hydro-pneumatic recoil system, and firing tests revealed that the gun was very accurate. However, the use of separate-loading ammunition meant that two loaders were required, one to insert the projectile and the other the cased propellant charge, and this resulted in a low rate of fire. The large volume of smoke resulting from the firing of the gun often give away the position of the vehicle, and often momentarily blinded the crew as a result. By a time early in 1943 the decision had been made to install this gun on the chassis of the Panther battle or Tiger I heavy chassis to create a heavy assault gun, but the Panther chassis was considered unsuitable after a wooden mock-up of the design had been examined. On 20 October 1943 another wooden mock-up was built on a Tiger II chassis, and presented to Hitler in East Prussia. This paved the way to the manufacture of two prototypes, one with Porsche torsion-bar suspension characterised by eight road wheels, and the other Henschel torsion-bar suspension characterised by nine overlapping road wheels as used on the production version of the Tiger II. The two prototypes were completed in February 1944. 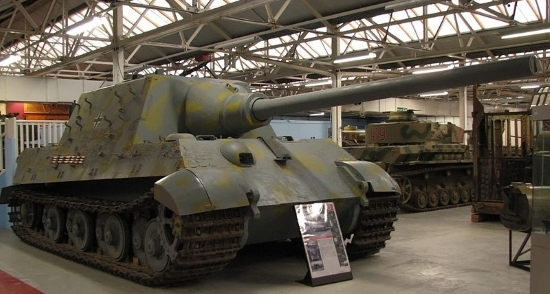 The new type was initially designated as the Jagdpanzer VI, but was later named as the Jagdtiger. The Jagdtiger was a logical extension of Germany’s current process of creating Jagdpanzer designs on the basis of tank chassis. The Jagdtiger used a boxy casemate superstructure, its sides manufactured integral with the hull’s sides, above a lengthened version of the Tiger II chassis. The resulting vehicle featured very heavy armour and the PaK 44 gun capable of defeating the protection of any tank fielded in World War II, even at range beyond 3,825 yards (3500 m). The Jagdtiger had armour 9.84 in (250 mm) thick on the front of the casemate and 4.92 in (150 mm) thick on the glacis plate. The main gun’s mount provided the limited traverse arc of only 10°, and the whole vehicle had to be turned to lay the gun outside that narrow arc. The gun’s elevation arc was from -7.5° to +15°. The main gun was provided with 38 rounds of ammunition. The Jagdtiger suffered from a variety of mechanical and technical problems as a result of its weight of 158,069 lb (71700 kg) and Maybach HL 230 P30 water-cooled V-12 petrol engine, which delivered 690 hp (514 kW) and powered an Olvar pre-selector transmission with eight forward and four reverse speeds. The vehicle frequently broke down, and in the final analysis more Jagdtiger vehicles were lost to mechanical problems or lack of fuel than to enemy action. Something between 77 to 88 Jagdtiger vehicles were built by the Nibelungenwerk (Steyr-Daimler-Puch) from July 1944 to May 1945, the first 11 of them with the Porsche suspension and the rest with the Henschel suspension. Some sources aver that no vehicles were completed after February 1945, and toward the end of the production run some vehicles lacked important equipment and could not be used operationally, or could even be delivered to units. The two units equipped with the Jagdtiger were the 512nd schwere Panzerjägerabteilung and 653rd schwere Panzerjägerabteilung from September 1944. About one in five of the vehicles was lost in combat, and most of the others were destroyed by their own crews after being abandoned late in the war as a result of mechanical breakdowns or lack of fuel. Three vehicles survive in tank museums. Other than the 11 early vehicles with the Porsche suspension, the only Jagdtiger variant to be developed was the SdKfz 185, which differed only in having the 88-mm (3.465-in) PaK 43 rather than the 128-mm (5.04-in) PaK 44 gun. This was the result of shortages of the larger-calibre weapon, and no examples of the SdKfz 185 entered service. Other data for the Jagdtiger included a crew of six, secondary armament of one 7.92-mm (0.312-in) MG 34 machine gun in the glacis plate, length of 34 ft 11.33 in (10.65 m) including the gun, width of 11 ft 9.75 in (3.60 m), height of 9 ft 2.25 in (2.80 m), road speed of 21 mph (34 km/h), road range of 75 miles (120 km) and cross-country range of 50 miles (80 km).